A lot has been made of the importance of narrative to any kind of instrumental, or wordless, music. This may hold doubly true for electronic music, which speaks in its own vocabulary and operates in its own paradigm, with its own taboos every full electronic album needs to be some grand, convoluted concept album, like a journey through a body or a soundtrack for a race of amphibious extraterrestrials. Though fascinating, one might argue that this overlooks a producer’s personal journey, as a compelling narrative. Body Pill, the debut LP from Anthony Naples, for Four Tet’s Text Records, is like a time-lapsed, fly-on-the-wall glimpse at a young producer, finding his own vocabulary, and figuring out what he’s got to say. Along the way, Naples moves through nearly every micro-genre of electronic music, from the past two decades. Album opener “Ris” comes on like a bank of pastel pink fog — beatless and amorphous — only to have a steady, stately square wave bassline come in halfway through, which could be a backing track from Future Islands’ On The Water. Naples does not stop at synthwave, however, as the next track, “Abrazo”, features the broken beat jazz drumming commonplace on Flying Lotus’ Cosmogramma or the stainless steel grime sculptures of Logos and Shackleton. Listening to Body Pill is indeed like hovering over Naples’ shoulders as he traverses desolate subway stations and back alleys, picking up musical genres and inspiration along the way like some technoid Metal Gear Solid. 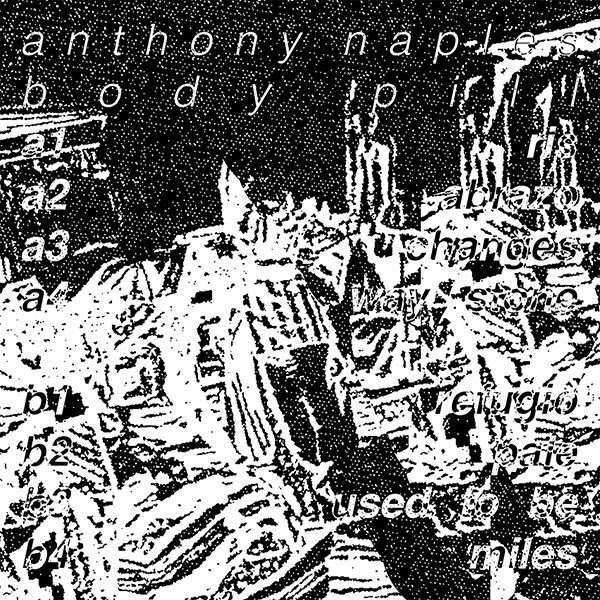 Anthony Naples is a wanderer — an assembler, a refiner. Body Pill does not redefine the wheel, nor does it intend to. There are numerous moments that are almost directly cribbed from dance singles of yesteryear (Darkstar’s “Aidy’s Girl Is A Computer” from 2010, in the case of “Refugio”), but it still sounds totally fresh and unique, in the context of the record. Naples is unafraid – unafraid to be himself, to do what he wants. When what he wants sounds so good, leave him to it. Body Pill is an auspicious opening for what should be a remarkable career. Naples has his incisors in the underground’s carotid artery, but he’s polishing the ingredients until they gleam like gold. For those that like the rough textures of industrial techno, from the likes of Downwards Records, but like to rein in the noise. For those that like outsider house, but feel it can be too glib. For those that like grime, and juke, and ambient, and live analog techno workouts, there’s something for you on Body Pill.